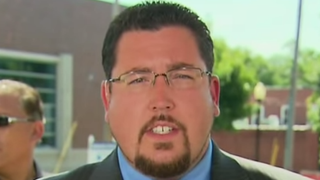 Five residents of Ferguson, Mo., have taken a step toward removing their mayor, James Knowles III, from his post, the Associated Press reports. The group filed an affidavit “seeking to recall Knowles,” AP explained. All they need are signatures of 15 percent of registered voters in the last mayoral election to jump-start a special election process to find a new mayor. Knowles once considered his job to be “ceremonial,” presumably because he presides over a fairly small city of about 21,000 where, AP reports, he makes only $4,200 as mayor. But that was before former Ferguson Police Officer Darren Wilson killed unarmed 18-year-old Michael Brown. The killing sparked a national uprising about police use of excessive force in African-American communities. AP reports that Knowles has opened an office in City Hall to address all of the problems his office has fielded since Brown’s killing and hopes to see Ferguson through this crisis, regardless of the effort to have him removed. “Obviously there are people on the street calling for my resignation,” Knowles told AP on Friday, “but my voicemail, my text messages and my Facebook are full with literally hundreds of people who want me to stay. “Somebody has to show leadership, and I'm focused on how we can move this community forward,” Knowles continued. His critics disagree. They say that Knowles should have known and done something sooner about the racial bias that a Justice Department investigation found to be rife in the city’s law-enforcement agencies. So far, six city employees, including the Ferguson police chief and the city manager, have received pink slips or resigned in recent months. In addition to his mayoral duties, Knowles works full time as a general manager at a state-contracted motor-vehicle-license office.